Check out the Hotel del Coronado or, more specifically, the Coronado Beach in front of the hotel. 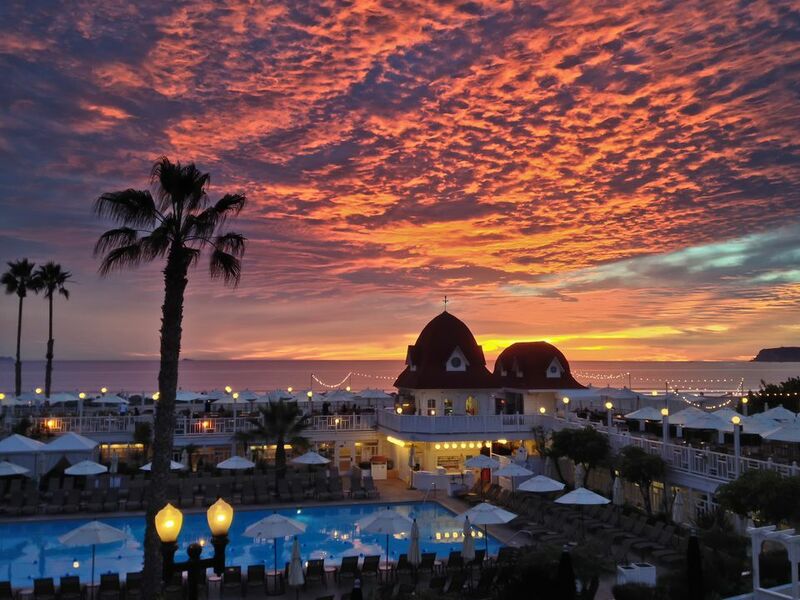 Because not only does Coronado have the best and widest stretch of sand in the county, you have the majestic Hotel del Coronado as your backdrop. It is the perfect ambiance for a stroll or a picnic. Maybe you can't afford to stay at the Victorian hotel, but you can enjoy the grounds after walking the beach and pretend you're guests of the hotel. It's one of the most beautiful natural spots in San Diego, and La Jolla Cove is a favorite of locals and tourists alike. The La Jolla Cove is a perfect place to stroll hand-in-hand and take in the ocean below. Plus, the ritzy La Jolla business district is nearby for some dining and window shopping. Speaking of majestic, nothing gets much better than the museum row, known as the Prado area of Balboa Park if you're looking for an intellectual date night. It's also romantic to walk around before or after exploring a museum or two. The arcade walkways and Spanish Moor architecture providing an old-fashioned romantic backdrop. Stroll the area and hidden garden areas in the late afternoon, when the sun casts a golden light upon the buildings—sheer beauty. Why do you think so many wedding parties take their portraits here? Just west of Balboa Park, in the Banker's Hill neighborhood, is a place where you can feel like you're on top of the world. Bertrand at Mister A's is a restaurant that offers a stunning 12th-floor panoramic view of the city. A little too steep for dinner? You can still enjoy watching the jets landing outside the windows by just having a cocktail at the bar. A drive-in movie theater makes for a fun and romantic date. You can pack your own special meal (unless you want to go the concession stand route), and you can get cozy in the relative isolation of your vehicle. Call it retro romance, old-school style. Besides, there might not be too many chances to use this date card in the future: there are only two drive-ins left in San Diego—the South Bay and the Santee. Do you feel like an evening cruise on the water while sipping drinks or enjoying music? The Bahia Belle is perfect for you and your honey. Cruise Mission Bay aboard this Mississippi-style sternwheeler as it makes a loop between the Bahia and Catamaran hotels on Mission Bay. Are you the type of person who prefers to get away from it all? Then head up to the mountain town of Julian in the Cuyamaca Mountains, which is about 1.5 hours away from San Diego. Breathe the mountain air, stroll the little town, take a romantic carriage ride, eat some Julian apple pie, and maybe stay at a bed and breakfast. Whatever you do, you'll feel relaxed and refreshed after a visit to Julian. The name says it all: Sunset Cliffs. What could be more romantic? On the far edge of the city, just south of Ocean Beach and on the cliffside of the Point Loma Peninsula, Sunset Cliffs has about 68 acres of bluffs and walking paths high above the Pacific Ocean. The rugged cliffs sit above some of the area's most favored surfing beaches, which aren't too easily accessible. Park your car in one of the lots right on the cliff, sit on the sandstone, and get lost in the scenery and sunset. Just be careful; you can easily lose your footing and slip down the treacherous cliffs. It's not exactly Venice, but the Gondola Company attempts to reproduce the magic and tradition of Venice right here in San Diego as you gently cruise in a private gondola through the canals of the Coronado Cays, across San Diego Bay from downtown. It's a nice way to spend a romantic hour on the serene waters of the Bay.